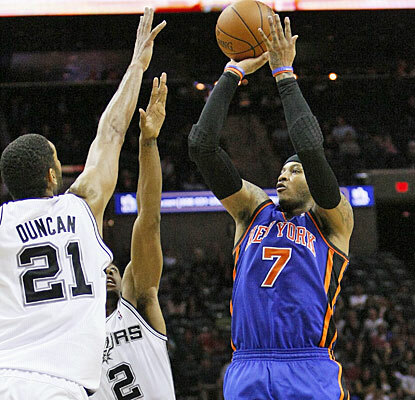 The Knickerbockers are in San Antonio tonight to take on the 7-1 Spurs. The Knicks are coming off a 99-89 victory over the Magic on Tuesday night, and carry their undefeated record into the heart of Texas. The Spurs are coming off a 84-82 win against the pre-Dantoni era Lakers, and have won three straight overall. The Spurs are one of the few teams around the league playing just as well as the Knicks. I still don’t understand how this game isn’t one of the two on TNT tonight, but I guess it is okay, I’d rather listen to Breen/Frazier than Marv/Reggie. Anyway, tonight’s contest is the first major measuring stick for the Knicks this season as they take on the Spurs. Yes they did beat down the Heat on opening night at the Garden, but the great teams are the ones who can get a win on the road against a top opponent. The Knicks haven’t won at San Antonio in their last eight tries, and the Spurs have won 22 of the last 24 games at home dating back to last season (those losses came in the Western Conference Finals to the Thunder). So the Knicks have their work cut out for them tonight, and need to continue to do the things that have them sitting at 5-0 in the early season. Continue to win the turnover battle: The Knicks are currently tops in the league as far as turnovers go, committing just under 11 per game, significantly improved from a season ago. On the flip side they are forcing the most turnovers in the league at 17.58 per game according to HoopsData.com. Making sure you don’t waste any possessions is obviously important, no more so when you play against a veteran team like the Spurs. The Knicks are going to need to continue to take care of the basketball tonight to give them the best opportunity. Attack the glass: So far this season it’s hard to look at the Knicks and pick out a flaw, but if you were going to talk about one it has been their rebounding. The Knicks are actually 2nd to last in the league in rebounding differential, and have allowed the 7th most offensive rebounds per game. They are the best defensive team in the league as of now, but cleaning up the defensive glass is just as important as forcing a bad shot is. I would like to see a little more Marcus Camby tonight. Keep Tony Parker out of the paint: The Spurs are at their best when Tony Parker is getting into the paint and breaking down the defense. He is one of the best point guards in the league at creating havoc with his penetration and using his tear drop to get easy buckets. He averaged 32 ppg against the Knicks last season, and if Felton/Kidd/Prigioni do not keep him out of the paint he could be in for another big game.